About a month ago, Jennifer Lawrence was in the news for being rather rude to a reporter during a press conference at the Golden Globes. Across the nation, many young hearts sank at the thought that this down-to-earth, relatable movie star (usually so cheerful and winsome) could be so callous. The story circulated on social media, then came the follow-up opinion pieces about how her words and tone were justified based on new information. Regardless of what we ought to think of this story, it's clear that we as a culture care a great deal about what movie stars do and who they are. And that is the question at the heart of the latest release from the Coen Brothers. Who are the people behind the movies we love? Does it matter what kind of people they are? Hail, Caesar! is a love letter to classic Hollywood that paints a studied contrast between the emotional uplift of movie magic and the flawed mortals that create it. The first thing you should know about this movie, if you've seen the trailer, is that the marketing is a bit misleading. Rather than a slick, fast-paced farce, Hail, Caesar! is a thoughtfully understated comedy. That's definitely not a bad thing, but I had to really shift gears after the film started to adjust to the more ponderous tone. Josh Brolin plays Eddie Mannix, a movie producer overseeing a wide tableau of films at Capitol Pictures in the 1950s. In addition to managing the shootouts, dance numbers, and grandiose sets of the studio, Mannix must also juggle the indiscretions of his stars, making bad press go away. As he moves between buildings at the studio, we're treated to a series of delightful vignettes showcasing the old Hollywood genres. Scarlett Johansson executes adorable princess-waves amidst a bevy of synchronized swimmers, Channing Tatum proves he can dance and sing while looking handsome, and George Clooney delivers epic monologues on the dusty roads of ancient Rome. The titular Hail, Caesar! is Capitol's most prestigious release and it evokes Ben Hur in more ways than one. In the midst of all the fixing Mannix is already doing, his duties are further complicated when Clooney's character is kidnapped by some mysterious men calling themselves The Future. But the story's not really about that, contrary to what the trailer would have you believe. It's more of a slice-of-life, behind-the-scenes look at a romanticized old Hollywood. Various subplots from Mannix's personal life and the lives of the stars are given just as much weight as the kidnapping. My favorite scene involved a high brow director (Ralph Fiennes) struggling to make a thespian of a cowboy. I also particularly enjoyed a subplot about a pair of rival gossip columnists, each one thinking she is above the petty sensationalism of the other. All the actors here, and the Coen Brothers themselves, are clearly having the time of their lives. The film is thoughtfully acted and beautifully shot. The artful lighting and gorgeous color are a breath of fresh air amidst the grain and dull teal of 2016 cinema. The one aspect of the film that perhaps brings it down a little is a lack of consistency in tone. I highly recommend reading this fascinating memo from The Brady Bunch's Robert Reed on the different genres of comedy and why mixing them can be problematic. I think Hail, Caesar! suffers from a bit of that. Some jokes are a little too out of place to really hit hard. But it's a small complaint, and one I can probably blame on the misleading marketing anyway. One last tidbit about the film: I was pleasantly surprised by how religious it was. Most Hollywood blockbusters feel benignly atheistic to me, as if the studios are either made up mostly of atheists or they're afraid they'll alienate their target demographics if religion slips into their scripts. Hail, Caesar!, however, feels refreshingly sincere in its approach to its religious elements, none of which feel pedantic or forced. In the high points of the movie, we really feel the fervor of a great cinematic speech, we find ourselves grinning as talented whippersnappers tap dance across the screen. These moments, scattered across thousands of films, are truly uplifting, even if the lives of the films' creators leave some integrity to be desired. They're not perfect. Neither are we. Let's keep going to the movies anyway. 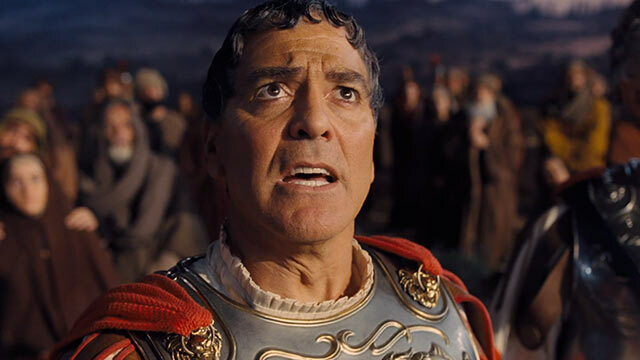 The trailer for Hail, Caesar! was a lot of fun and I confess I'm a little disappointed I didn't get to see the movie it advertised. The film itself, nevertheless, is a wonderful piece of mirth and sincerity and I highly recommend it. Rated PG-13: Some language, some suggestive thematic elements, lots of smoking. I agree with all of this. Such an interesting and weird film.